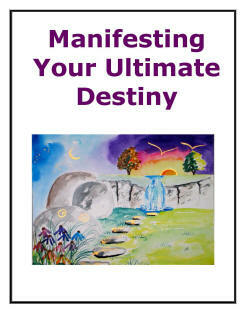 Manifesting Your Ultimate Destiny -- Whatever That Means To You! “Manifesting Your Ultimate Destiny” means pointing your life in the right direction—and this book will help you define exactly what that means to you. You’ll develop a mental picture of a perfect life and learn the mental skills needed to make that picture manifest. Whether you’re already on the path or still wondering how to take the first step, “Manifesting Your Ultimate Destiny” will help you understand what you were born to do, through self-discovery tests and exercises. You’ll learn to set goals, develop action plans, and assemble the support team to help you reach your heart’s desires. You’ll be able to apply these successful living skills to every area of your life. Subscribe to our Free Newsletter to enjoy instant access to Ultimate Destinyland™ and receive the gift of this powerful new 100 page program Manifesting Your Ultimate Destiny! How to R.U.B. your own Genie's lamp and make your wishes come true! Believe in your dreams that are just waiting for you to come true, Imagine That! 7 Steps to Discover and Manifest Your Ultimate Destiny! How to live your life so you have absolutely No Regrets when you "graduate"! Motivision, 21 Steps to Your Ultimate Destiny ... and much, much more! Simply use your first name and your primary email address as your password in the form below for instant access to your Free Copy of Manifesting Your Ultimate Destiny Program and instant access to the World of Ultimate Destiny where you will discover over 1,001 more Treasures and Featured Resources to help you realize more of your potential, fulfill your life purpose and know how to manifest your ultimate destiny, whatever that means to you!